Recep Tayyip Erdogan has suggested that Turkey could soon launch a new incursion across the border into northern Syria. Erdogan’s address to a military ceremony honoring Turkish commando soldiers on Friday renewed his threat to expand Turkey’s military operations into areas east of the Euphrates River held by US-backed Kurdish militants. “God willing, very soon…we will leave the terror nests east of the Euphrates in disarray,” Erdogan said. Most recently, Turkey deployed forces to Idlib Province in the Euphrates River’s western side as part of a joint operation with Russia to create a buffer zone. 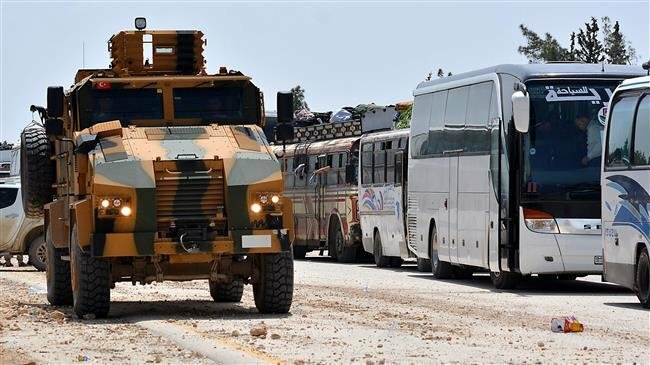 Ankara’s agreement with Russia forestalled an imminent offensive to liberate Idlib where several Turkish-backed militant groups are based. Syrian President Bashar Assad said earlier this month that the Russian-Turkish deal to avert a military offensive in Idlib is a “temporary one” that prevented bloodshed but that his government’s goal is to restore control over all of Syria. Erdogan said recently that “the biggest threat to Syria’s future lies in the nests of terror to the east of the Euphrates,” citing the Kurdish People’s Protection Units (YPG) and the Democratic Union Party (PYD) which are supported by the US.